The Windows registry is a database that contains thousands of settings and options to allow your computer to function. 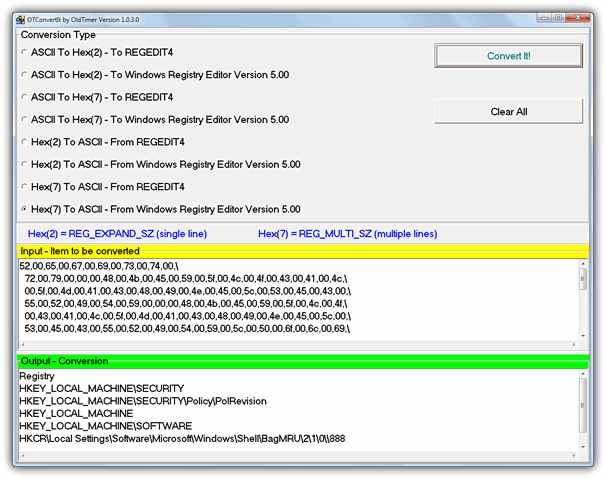 There is a built-in Registry Editor (regedit) that allows the user to make changes to the registry, although if used improperly, regedit could mess up your Windows install. One of the very useful functions that can be found in the Windows Registry Editor is the option to backup and restore certain parts of it, called export and import. Before making any changes in the registry, it’s always advisable to backup/export the registry keys first. You can do that by right clicking on the registry key that is located at the left hand side tree and select “Export”. Double clicking on the .reg file which you have backed up earlier will restore back the changes. On the right hand side of the registry window, you will find the registry values. 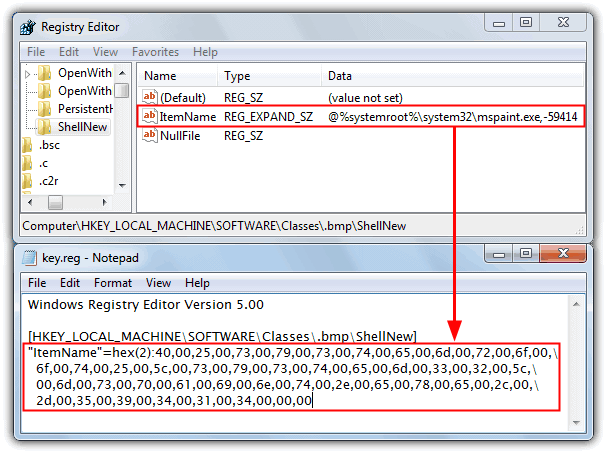 There are several different types of registry values, but the 6 you will find and can create in regedit are String, Binary, DWORD, QWORD, Multi-String and Expandable String. 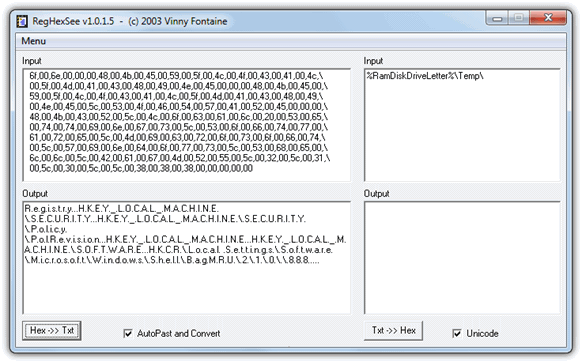 All of the values are displayed in standard ASCII text from the Windows Registry Editor which makes them easy to read. However, after exporting them to a file, you will notice that some of these values are displayed as “hex” text values and not the standard text you find in the registry. To be more precise, only String (REG_SZ) and DWORD (REG_DWORD) values are displayed in clear text, while Binary (REG_BINARY), QWORD (REG_QWORD), Multi-String (REG_MULTI_SZ) and Expandable String values (REG_EXPAND_SZ) are in the hexadecimal format. If you want to view these hex values as clear-text inside a registry file, you can’t do it unless they are imported back into the registry. Another solution is to use a simple tool that can easily convert the registry hex values to more readable text values to make the data more understandable. Here’s 4 free tools that can help. If you want a simple to use tool that can convert the single line REG_EXPAND_SZ or multiple line REG_MULTI_SZ values from a registry file, then a small program we’ve created ourselves called Reg DeHexer could be useful. It will strip out all the Unicode and null characters etc, and show the decoded value in standard ASCII text format. All you have to do is copy the hex registry value from a registry file, the whole value or everything after the “=” is acceptable so the program can detect single or multiple lines. Then click paste to populate the top window from the clipboard and hit Convert to decode. You can highlight part or all of the result, right click and copy it. Reg DeHexer works on Windows XP and above and is a standalone executable. 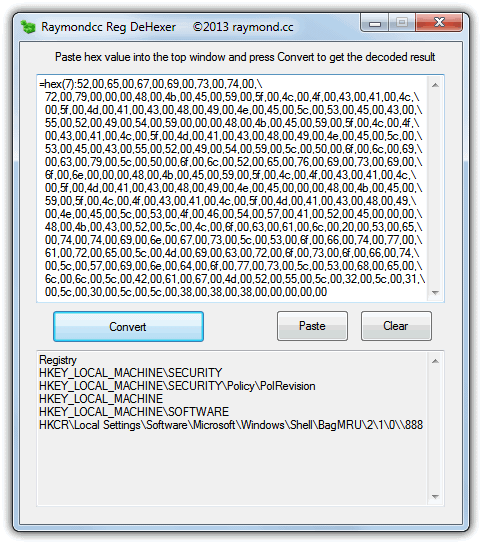 Old Timer’s ConvertIt is a simple to use tool that will convert single and multiple hex strings to ASCII text and also the reverse of creating hex values from ASCII text. It supports both the old Windows 9x version 4 and the modern version 5 registry .reg files. Paste in the hex (everything after the colon in the .reg file) or text value, select the conversion method and click the button. The result is clean and stripped of erroneous characters. Hex(2) is for a single line value, Hex(7) is a multiple line value. OTConverIt is only 174KB in size and portable. ReHexSee is an old utility dating back tot 2003 and we couldn’t find the last minor updated version. It allows you to manually or automatically paste in the registry value (after the colon “:”) and will output the text result. The result isn’t perfect with the output formatting but will at least give you some idea what the text strings are. A useful option to convert text back into a standard hex value is also available with an optional tick box to output in Unicode. RegHexSee is portable and 400KB in size. Unlike the other tools, Hex2Text is a command line only hexadecimal string to text converter. You will have to run this tool through the Command Prompt and specify the input filename and output filename. 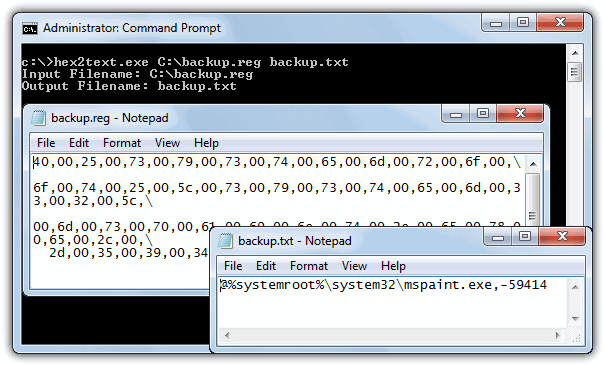 Here is an example of converting an exported backup.reg file to a readable backup.txt text file. The <input_filename> is the name of the file with the input hex to convert and <output_filename> is the name of the file where to save the output text. Although Hex2Text will convert the hex strings without a problem, it does also try to convert everything else in the file, even if it’s standard ASCII text, so parsing a complete .reg file will produce a number of unreadable characters. For best results use a file with just hex values in the input file. Amazing technique to convert plain text into the binary, for my study purposes I often need to use some online tools. Before I found this, I used binarytranslator but when there is no internet, I could not do anything. Now with the help of this information, I can easily convert the text by my own. Thank you very much for sharing such information and looking forward to visiting this kind of blogs in the future as well. Amazing!! All of these tools are looking really interesting!! For some time, I have been using binarytranslator tool to convert the plain text into the binary and binary into the Plain text. Now I have come to know about these tools so along with binarytranslator I am looking to use all these binaryconversion tools in the future. Hi All, there’s a new tool and town, that decode Hex values for all entries. It’s called RegtoText and demo is available at regtotext.blogspot.ca ! Martins’s program looks very nice on the blog page, but sadly it fails to run on my computer. I do not see any information on the blog page about system requirements, prices, or restrictions in the demo version of the program that is available on that web page. A convenient way to get this info is export the key, not as a .reg but, select “save as type .txt” from the drop down. Along with the clear text (just as you would see it from within regedit) it gives you the LWT and class name. I especially like the fact that the Last Write Time (LWT) is included, since Regedit doesn’t display that info and I have previously had to fire up NirSoft RegScanner or Registrar Registry Manager to check when a key was last modified. Only decodes “ProgramIgnoreList”. If I want to decode “ExcludePaths” then I need to delete the latest key. I am having the same problem as Jeff Taylor above. When I paste the hex value into your program RegDeHexer and click on convert nothing happens. No output shows in the “Conversion result…” pane at the bottom of your program. I am running Windows 8.1 Pro 64bit. On a different, but related, topic, some readers finding this post might be interested in knowing that converters are available to translate REG_BINARY strings exported from the Registry as HEX values. Many (perhaps most?) of those strings won’t have any text content, but some do. All the converters for this job that I found through Google are web apps. I tested several, and the best I found was branah.com/ascii-converter. It will accept input in either ASCII, HEX, Decimal, or Binary formats, and simultaneously produce a conversion to all of the other types. I really wanted an offline tool, but I ran out of patience with Googling before finding any. Besides the web apps, there are a lot of web pages that show how to prepare a script that will do the work (or part of it). Do you by chance know of any utility that will do this, and has an input interface like Reg Dehexer or OTConvertIt? Thanks for putting up this post, and for the work that went into your research. A converter like this will often be very useful for me. However, I had a fundamental problem using your Reg DeHexer–it wouldn’t work. I input a number of HEX strings that OTConvertIt handled perfectly (i.e., output matched what was shown in RegEdit). However, nothing happened when I tried the same strings with your tool. After clicking “Convert,” there was no output (i.e., the bottom pane remained empty), even when the processor was inactive.